STERLING — If you do much hiking in Southcentral, you've probably resigned yourself to the necessity of pushing uphill. It's not like you have much of a choice: Surrounded by mountains, you do what you gotta do. But there are a precious few flat hikes to be had in Southcentral, and earlier this summer I discovered a gem: the Seven Lakes Trail in the Kenai National Wildlife Refuge near Sterling, a 4.5-mile trail through spruce forest from one lakeshore to another with less than 150 feet of elevation gain along the way. Contrary to the trail name, you won't pass seven lakes, just four. When Skilak Lake Road was built, it cut off access to the other three north of the road. But the four lakes on the trail are lovely, and their presence keeps an otherwise flat, easy hike without a lot of open vistas from becoming boring. 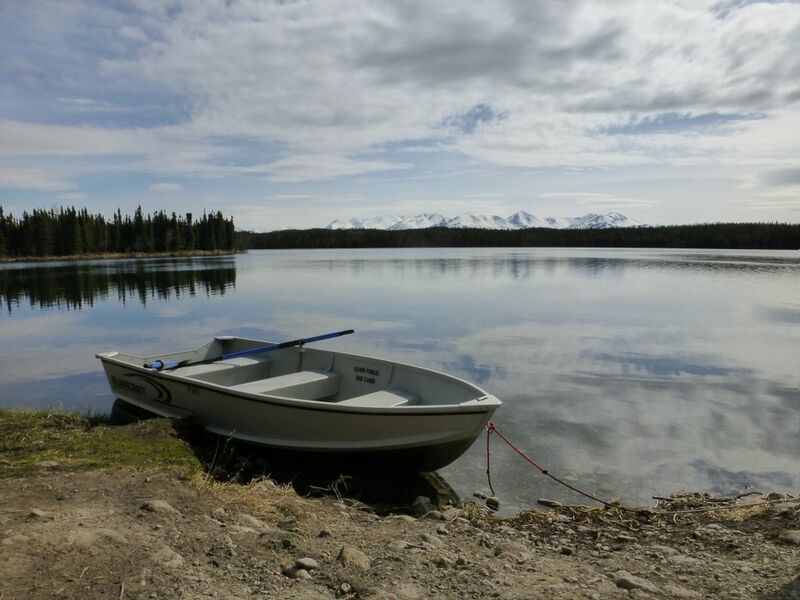 Seven Lakes is actually a short thru-hike: If you have a second car at your disposal, drop it at the Kelly Lake/Peterson Lakes trailhead at Mile 68.8 of the Sterling Highway, then head to the Engineer Lake trailhead at Mile 9.5 of Skilak Lake Road. This barely-maintained road often has some gnarly ruts. When I visited, they were miserable at its western intersection with the Sterling Highway but not too bad at the east intersection. Accessing Skilak Lake Road from the east end also means you'll be able to see the sign for the trailhead, which is hidden by greenery if coming from the west. The trail starts out with an easy, half-mile stroll along the forested shore of Engineer Lake. As you leave the lakeshore behind, the trail forks. 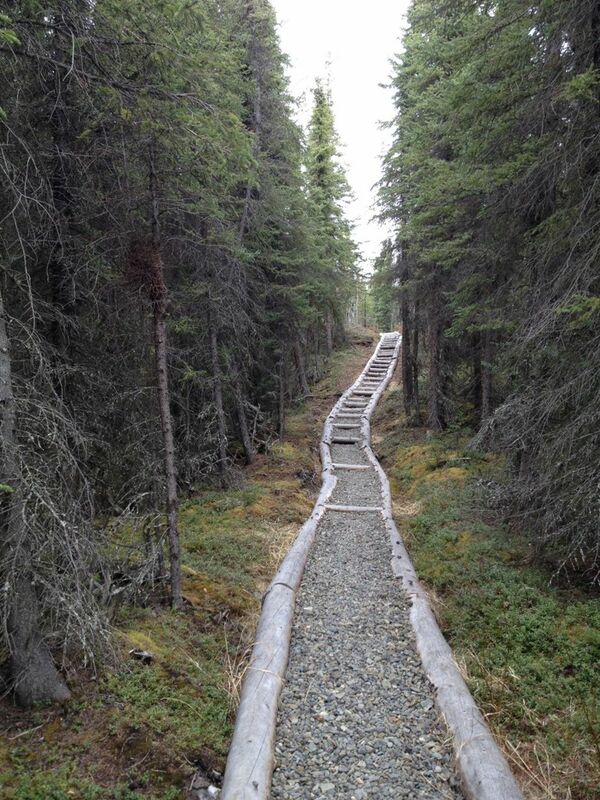 Go left to stay on the Seven Lakes Trail, and head up a beautiful, shallow staircase that makes great use of logs to frame gravel-filled steps. Turn right and another half-mile or so of side trail takes you to the Engineer Lake public use cabin. Both the Engineer Lake cabin, which sleeps four, and the Kelly Lake cabin, which sleeps six, are available by advance reservation at recreation.gov. Each comes with the use of a pretty little rowboat during your stay; bring your own PFDs. If you continue up the staircase and along the Seven Lakes Trail, you'll notice one of my favorite things about this hike — the way the trail gradually sinks into a groove of its own making, assisted by many human feet. Combine that with the occasional rocks and frequent tree roots (mostly small), and this hike is potentially a ton of fun for young hikers. My inner child certainly enjoys treating this like an inverted balance beam, switching from in the trough to one foot on either side of it and back again. Another fascinating thing about this trail: Sometimes you'll notice the ground flexing gently beneath your feet. If you've seen those viral videos of a forest floor that seems to "breathe" between trees, this looks similar, but on a much smaller scale. It's so slight you might not notice if you're not looking for it. Forest roots have formed a flexible, tough mat that isn't particularly well-connected to the strata below, so it flexes and moves in response to your weight. If you aren't looking out for that telltale flex and give in the ground beneath you, all you'll probably notice is that the forest floor feels soft and cushy beneath your feet. About three-quarters of a mile farther down the trail, you come to another turnoff: This is a half-mile side trail that takes you to views of Hidden Lake, the 1,596-acre lake with a population of lake trout pursued by anglers. From there, it's another 1.2 miles to Hiker's Lake, which sits right beside the trail. These are quintessential lowland Alaska lakes: grassy, marshy edges, and a fairly homogenous tree line that's made more interesting by mountains in the distance. After another three-quarters of a mile or so, you reach the shore of Kelly Lake. You'll spend the next mile walking along its shore, with expansive views over the water and the easiest trail of the entire stretch. If you don't want to do the thru-hike, I'd start here at Kelly Lake and go at least as far as Hiker's Lake before turning back. This last trail segment also goes straight past the Kelly Lake public use cabin. I mean that literally — it's right on the trail, about a mile from the trailhead. That easy access makes the cabin great for families with small children or winter gear you want to haul in by sled along this broad, easy trail. But if you cherish your privacy, reserve the Engineer Lake cabin instead. Birders, this is a fun outing for you too — although the thick spruce cover along the trail means that your only real visibility is across the lakes. You'll still hear the birds in the forest, though. So this is a great place to practice playing "ear detective" with kids and grown-ups alike. TRAIL NOTES: Bring bug dope if you plan to spend any time standing still. CABINS: The U.S. Fish and Wildlife Service cabins are available by reservation through recreation.gov. Bring your own firewood and, if you plan to use the rowboats, bring your own personal flotation devices.